Jerry Grossman’s love affair with politics and issues almost matched his love affair with his wife. His marriage to Roslyn Grossman lasted an amazing 69 years, longer than many of us hope to live. Her death two years ago was a major blow to Jerry. But Jerry’s love affair with politics and issues predated Ros and post-dated her as well. Jerry began his book, appropriately entitled “Relentless Liberal,” with the declaration: Yes. I am a liberal, a relentless liberal, without reservation, without apologies, a product of my times, but rooted in values that can be found throughout history. Note, he used the word “liberal,” not the fuzzier “progressive” that many use because liberalism is not as much in vogue as it once was. Now, as an aside, we have a dictum at Council for a Livable World. If we support a candidate in his or her first major political contest, he or she will always remember who was with them at the beginning. That has been true with such political figures – (he says modestly) – as President Barack Obama and Vice President Joseph Biden. Or former Maine Senate Majority Leader George Mitchell. They remember who was with them when they launched their political careers. And that’s why it was so nice to see a tweet from Vice President Biden after Jerry’s death: “He was a good friend who worked tirelessly to advance U.S. security through nuclear arms control.” I am not sure that Jerry knew what a tweet was, but he sure would have appreciated the sentiment. But for Ted Kennedy’s first race, Jerry was on the opposing side. To Kennedy’s credit – and to Jerry’s – both men overlooked that original sin and became friends and allies for the rest of Ted’s career. Jerry was in politics, not for power, but for issues. And while he was fanatic about civil liberties and affirmative action, and hired the first African Americans and women as printing pressmen (press people?) in the 1940’s, his attention gradually turned to foreign policy and national security issues. He combined his passion for sports with his passion for politics In his book, he pointed out that the great boxer Mohammed Ali’s refusal to fight the Vietnam War helped to crystallize Jerry’s opposition to the war. Because Jerry loved the Boston Red Sox, in 1964, he picketed outside Fenway Park at a Goldwater rally. He also loved the Boston Celtics. 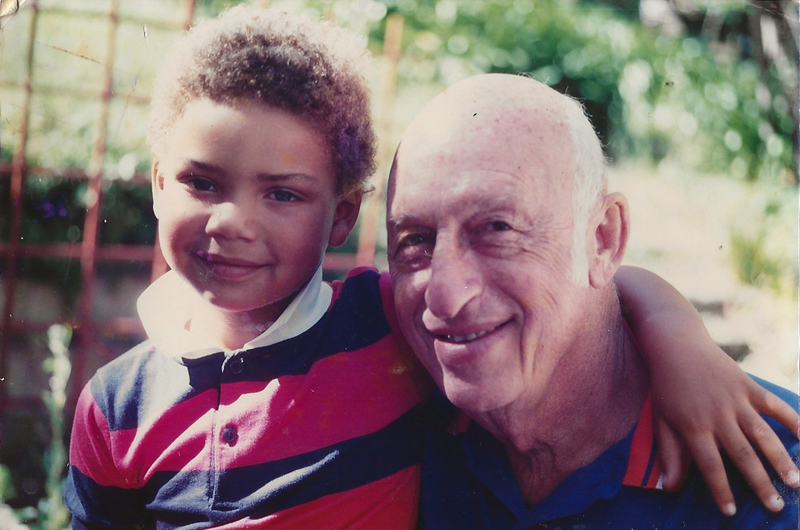 In 1990, when a potential Boston Celtics basketball player, looking for a home in Wellesley, was surrounded by police officers in Wellesley and forced to lie on the ground in a case of mistaken identity – and racial politics == == Jerry organized a letter signed by hundreds of Wellesley residents to apologize to the player, who did buy a home in Wellesley. 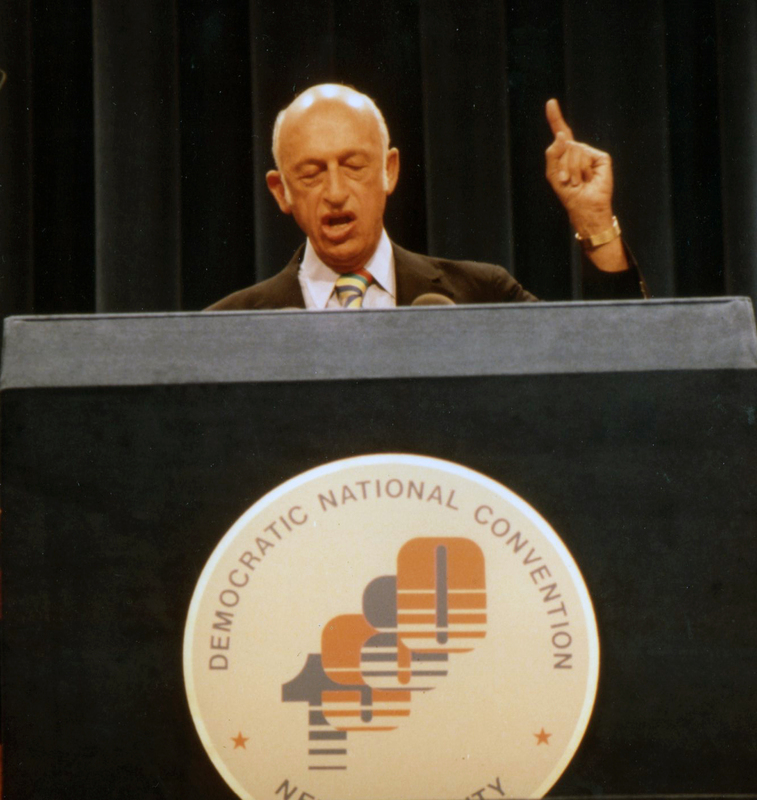 Jerry turned to the Eugene McCarthy campaign in 1968 to stop the Vietnam War. Again, politics to advance issues, not to gain power. 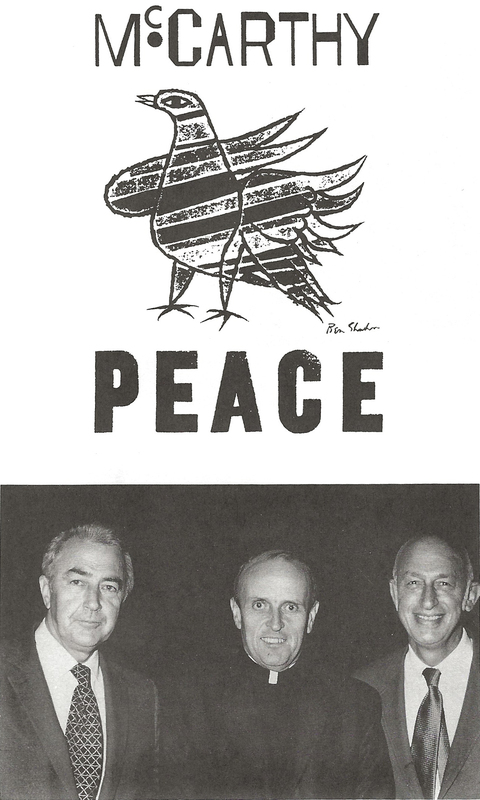 Eugene McCarthy failed in 1968, so Jerry looked for a campaign to advance the anti-Vietnam war message. And the campaign of pro-war Representative Philip Philbin fit the bill. Jerry always delighted in his role in steering Father Robert Drinan from the monastery into politics – although how much “steering” the Dean of Boston College Law School needed could be questioned. Drinan’s upset victory against the then-incumbent helped persuade Tip O’Neill, eventually Speaker of the House, to oppose the war, and helped turn the tide of the war in the country against the war. Politics to make a point. But it was the nuclear arms race that beckoned. In 1978, he joined the board of directors of Council for a Livable World, the year I began working at the organization. When the organization encountered difficult times, he became executive director in 1980. I reviewed his book “Relentless Liberal,” which says that he doubled my salary at the time. Somehow I don’t recall that. Did I tell you that Jerry was very careful with money, his, his company’s and his organization’s. Did I tell you he was cheap? When his personal stationery had an error on it, Jerry did not order new paper, he just crossed out the offending part and used the old stationery. But we established a great partnership that has lasted decades, stilled only by death. It was a political marriage that had only one major disagreement in all the years together, and I can’t even remember the topic. 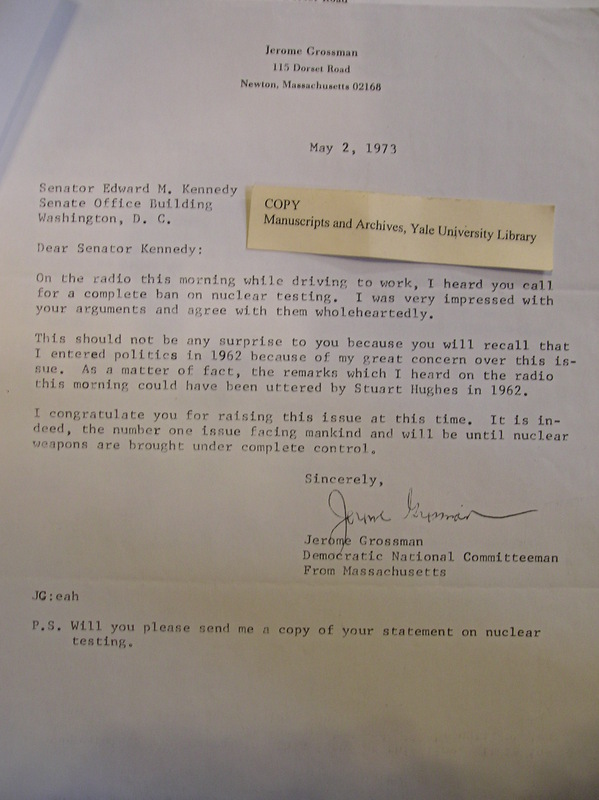 Speaking of personal traits, I am here to tell you that Jerry Grossman seamlessly passed very rapidly from the age of the quill pen to the fountain pen to the ball point pen to the manual typewriter to the electric typewriter to the computer. Except he skipped the last three stages. That is, he continued using his pen for all his writing and editing. Machines, even answering machines, were not close friends. Fortunately, as we passed drafts back and for the next 25 years, I could read his handwriting. He did master the telephone, but in the hundreds of times he phoned me, he also insisted on telling me when I picked up the phone, “This is Jerry Grossman.” Just in case I could not remember his name or recognize his voice. But while he never tweeted, he blogged almost to the end — although I do believe he has secret help from Dan with the typing and the uploading. At the Council, Jerry engaged in the process of trying to move Congress in the right direction on nuclear weapons issues. Congress at the time was not so hopelessly deadlocked as it is today. Jerry loved to travel to Washington, D.C. to talk about issues – and a little sports and politics at the same time. There was one meeting with former Senator Wendell Ford of Kentucky. Kentucky, you may recall, is home to the most famous American horse race. And by the way, I believe that Jerry played the ponies from time to time. So we went into Ford’s office, and Jerry and the Senator talked about the Kentucky Derby for the first 10 minutes or so. When the Senator finally said, you aren’t here to talk about horse races are you, Jerry mentioned the B-1 bomber, a highly expensive airplane carrying nuclear weapons that we did not need. Ford turned to an aide, who gave him a nod, and the Senator told Jerry, you have my vote. Jerry was shrewd about the way to highlight an issue. At a meeting with Iowa Senator Tom Harkin, Jerry made his case on our issues to the Senator. As we were leaving, the Senator asked Jerry about the Israeli-Palestinian question. As you may know, Jerry had strong opinions on the Middle East. Did I mention he had strong opinions on everything? But Jerry declined to venture an opinion, changing the subject. When asked after the meeting why he was so demure, Jerry replied, the Senator would only remember my answer on the Middle East, and not the issue that I came in for. When Jerry came to Washington, he was indefatigable. He left others in his lobbying groups breathless and he raced around for two or three days. Members of Congress loved Jerry, with his big personality and his infectious persona. Jerry sometimes told others how he firmly gave Senators and Representatives a strong piece of his mind on his issue. But don’t believe that. He was a teddy bear; he made his points but he was not rude or obnoxious as he pressed his point home. One of the most memorable lobbying days came when his grandson Noah, then about 11 years old, visited Washington with him. Jerry provided a quick lobbying training session to Noah and when we went into meetings, it is Noah who made the pitch. Although I am not sure Noah ever registered as a lobbyist. But enough stories. Jerry Grossman was truly dedicated to his issues, to making the world a better place, to his wife, and to his family: His children: Daniel Grossman Marilyn Grossman Jackson Richard Grossman His grandchildren: Jessie Ellen Grossman Samuel Maxwell Grossman Noah Jackson, the putative lobbyist Jolieba Jackson His sister: Ruth Sidel We have lost a passionate, caring and wonderful person. He has left the world a better place for his 96 years. And I have lost a partner in the fight against nuclear weapons and nuclear war.